For Celia, it’s even worse than for most of us – her regret is that, as an 11-year old, she ran away and lied about what happened when her best friend disappeared in the woods. Her memory is that Djuna simply disappeared; her story at the time was that Djuna got into a car driven by a strange man. Either way, Djuna was never seen again. Now in her 30’s, Celia is compelled to tell the truth and take her punishment. She goes home only to find that she is not believed. Her path to uncovering the truth uncovers some other uncomfortable truths, about herself and others. 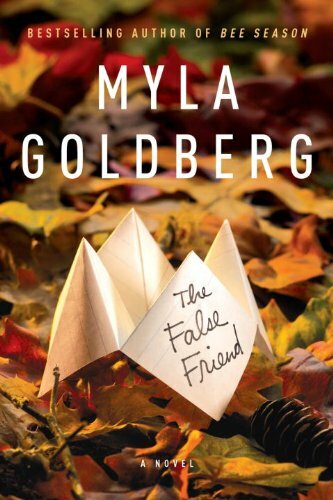 Well-written, Myla Goldberg’s The False Friend addresses questions about childhood, character and the changeable nature of reality. With keen insight into what it means to be human – a volatile and sometimes sad mixture of good and evil – Goldberg keeps the reader in suspense for much of the story. An excellent read. This entry was posted in Commentary, Review and tagged Myla Goldberg, Review, The False Friend. Bookmark the permalink.